On September 10th, 2018, the latest edition of the SAP on IBM i Tech News newsletter has been published and mailed to its subscribers. This time, it is compiling advantages of the IBM Power architecture for the usage with SAP software, as well as an introduction to SAP’s Core Data Services (CDS) in the context of advanced SAP application development for modern user interfaces. 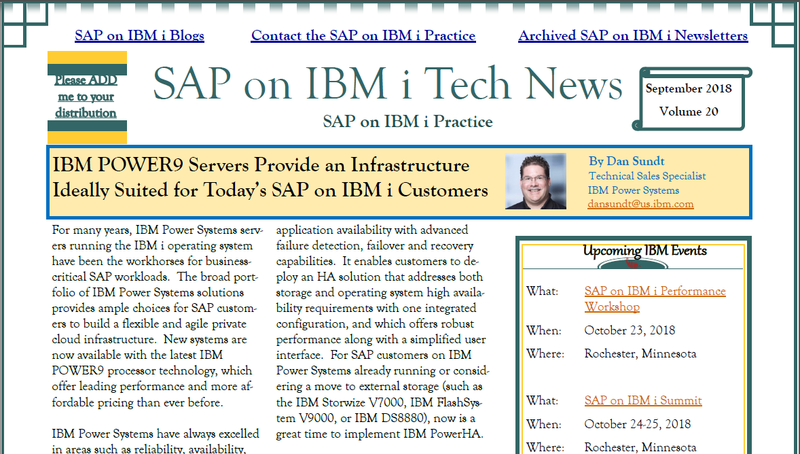 If you did not receive the SAP on IBM i newsletter by e-mail, you can find it here or browse the complete newsletter archive at https://ibm.ent.box.com/v/saponi-newsletter. To receive future newsletters automatically, click on the link “Please ADD me to your distribution list” in the upper left of the newsletter. We recommend that you download and apply the current level of PTFs at your next convenience, especially when planning hardware or software upgrades. If you have questions regarding the PTF process or individual PTFs, please contact the IBM support.